I painted canvas with Colin and Maranda's silhouettes to anchor the center of the table and hung cafe lights (from my wedding) to light the backdrop (a striped bed sheet). Old wooden boxes from my great uncle's barn in Virginia and a spray painted thrift store lantern added to the vignette. With the exception of the metal baking pan (that belonged to my grandmother) and a tin bucket for the pudding, various white platters were used to hold the food. We created an illuminating entry to the party with candle lanterns hung from shepherd hooks (that I made and used at my wedding over a year ago-waste not, want not. Right?) lining both sides of the walkway leading to the doors. 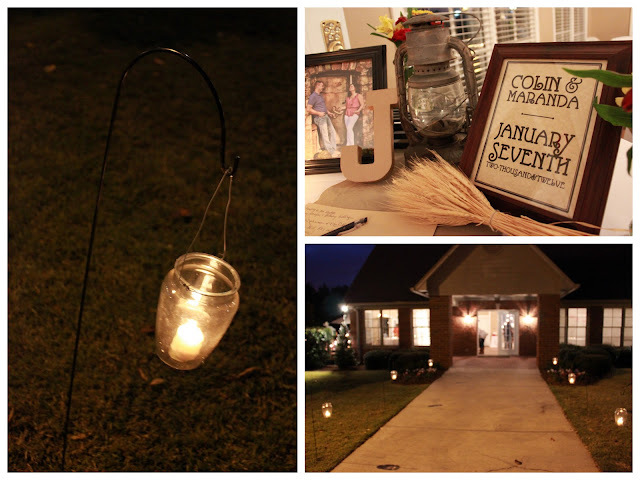 The sign-in table was styled with an antique lantern (belonging to Maranda's parents), a faux stalk of wheat from Michael's craft store, jars of arrangements and a cardboard letter in the initial of Colin and Maranda's new last name. 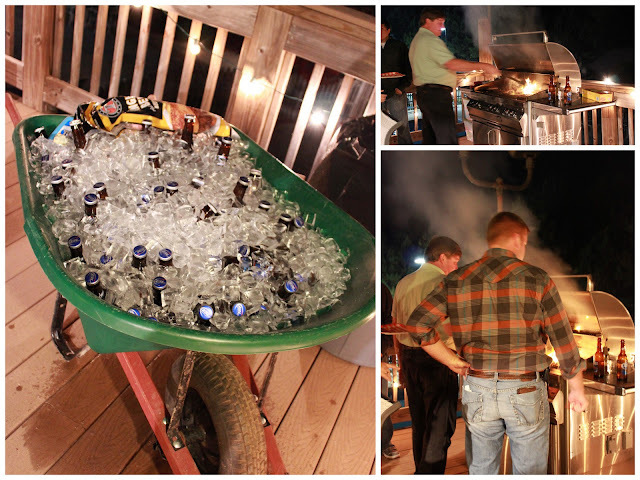 A gold horseshoe helped anchor the sign-in sheets on this windy night. The main menu consisted of hamburgers, hotdogs, corn on the cob, mini macaronis, baked beans, potato salad, cowboy dip and chips. 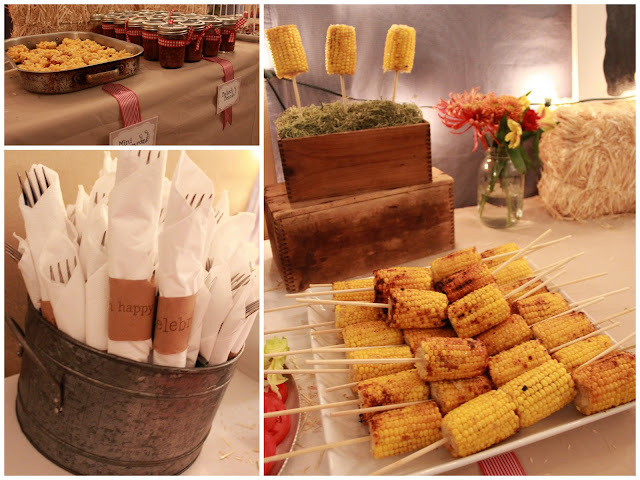 Napkins were wrapped in stamped kraft paper napkin rings reading "oh happy day" and "celebrate." 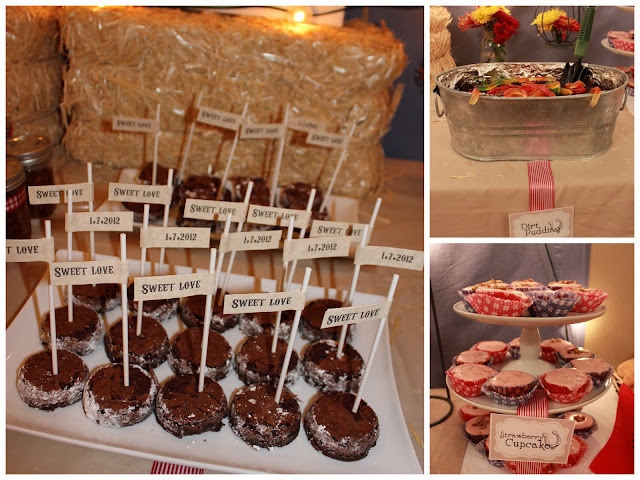 The designed labels for all of the goodies hung them from the table with striped red ribbon. 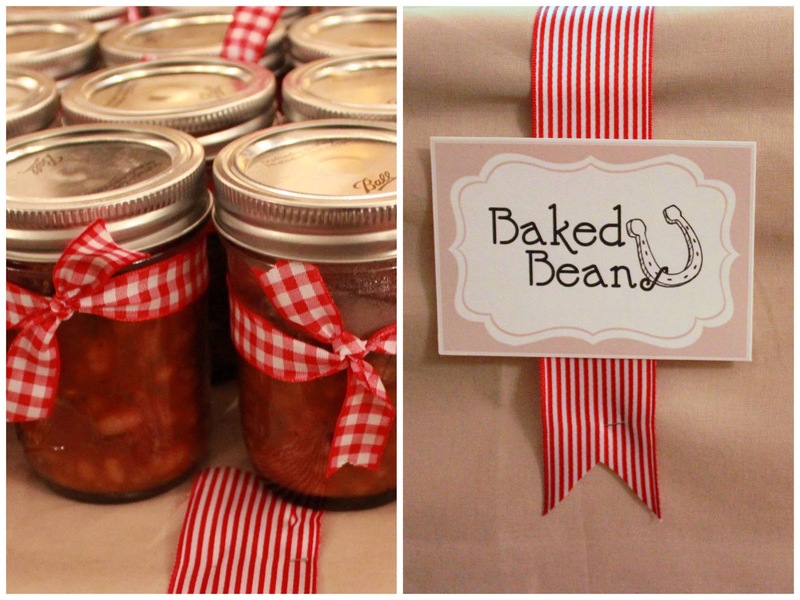 And don't you just love the individual jars of baked beans? The dessert menu consisted of strawberry cupcakes, dirt pudding (served with a garden trowel from the Dollar Tree) and brownies adorned with flags boasting the couple's wedding date and "sweet love." 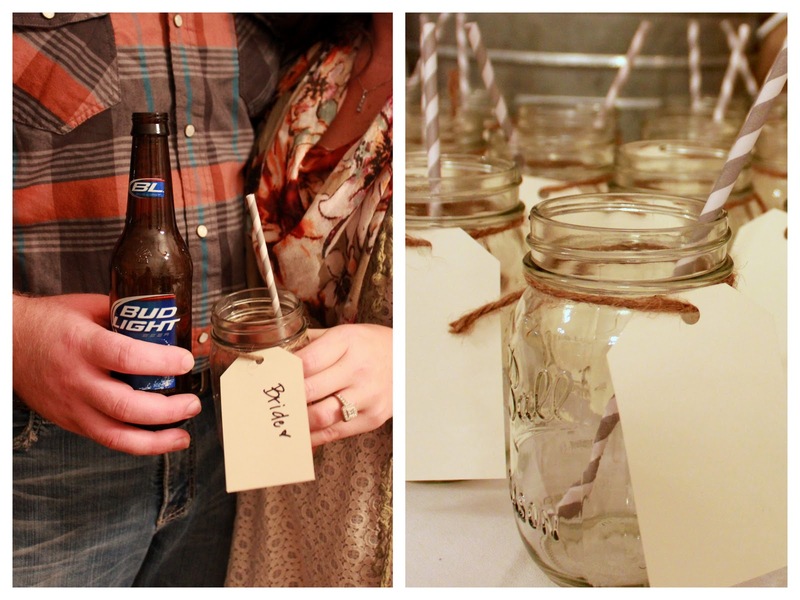 Guests got their drinks at "The Watering Trough" and made sure to personalize the drink tag hanging from their mason jar so we knew what drink belonged to whom. I initially was going to buy manila tags to use on the drinks, but then opted to make my own (there will be another post on that coming soon). The same striped paper straws we used at Mer's shower made another appearance (I can't get enough of them). 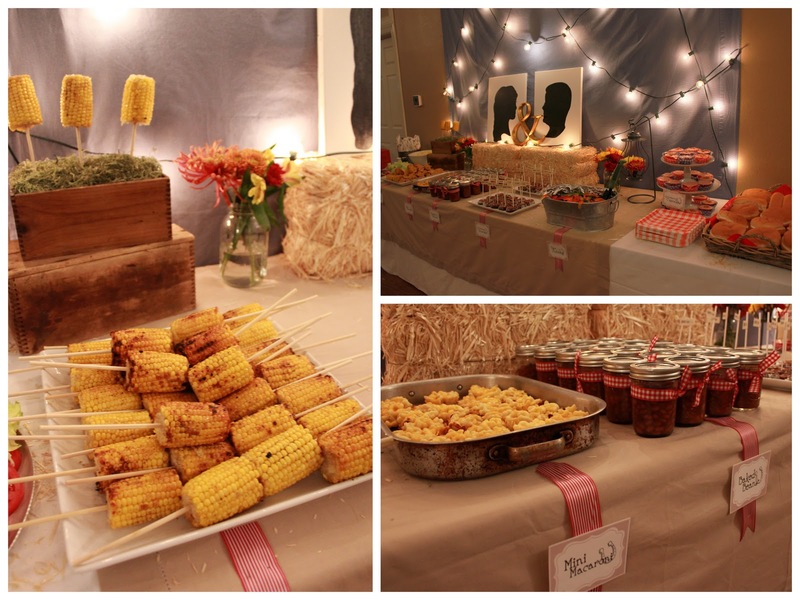 Canvas material was used throughout the party. I had yards and yards left over from one of my previous jobs (again, waste not, want not) that I put to good use. I cut out table runners and stenciled them in Colin and Maranda's initials to place on each table. 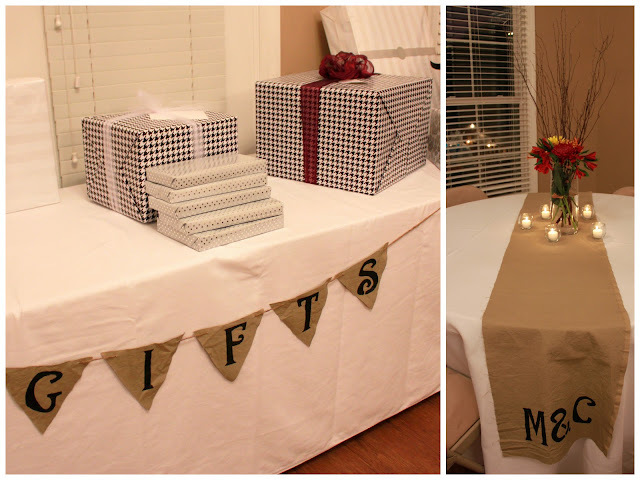 I also used the extra canvas fabric and some jute string to make a bunting so guests would know where to place their gifts. Fall colored flowers were used in all of the floral arrangements and, of course, my willow branches made another appearance as well. And now for the best part...the gifts! 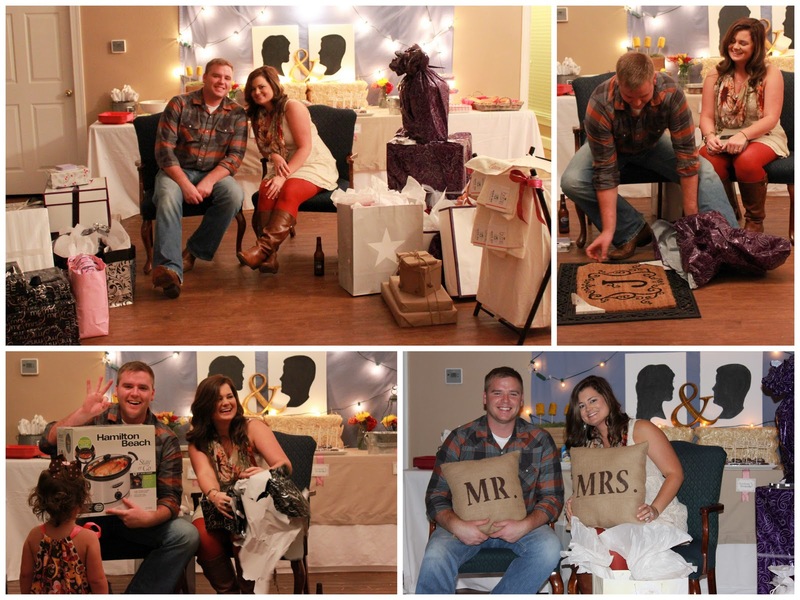 Colin and Maranda got some wonderful goodies (check out those adorable Mr. & Mrs. pillows made by a friend). And they also got a hysterical number of Crock-Pots...not one, not two, but three! (as Colin so appropriately shows in one of the pictures below). The shower was a great time for all, and the bride and groom were so appreciative of everyone who contributed to the evening. They made sure to tell us just how much they loved the outcome and all of our hard work, which made it even more of a success in my book! Congratulations, you guys! We're very happy for you and can't wait for the wedding!